Have you ever heard the old theatrical saying ‘break a leg’ before? If you have, then ask an actor what this proverb means. Most of them don’t really know, you know! And the reason behind this is because they have seen this film, Directed by Peter Bogdanovich; and Starting: Michael Caine, Carol Burnett, Christopher Reeves, Denholm Elliott, Nicollette Sheridan, and Julie Hagerty. Its first performance was in 1992, and only lasted 101 minutes. Must the show go on? That is the question which theatrical director, Lloyd Felloes (Michael Cain), is asking himself, now, mere hours before the first showing of his play called, ‘Nothing On’. He and his cast is still in dress rehearsals you see, trying to dot the i’s and cross the t’s to this overtly jovial production. Now this play is farcical one in nature, involving a country house tendered to by a doddery old housekeeper – an estate agent and his new beau – the owners of the house suddenly returning home unawares – and an inept burglar trying to steal items from said house. In addition to this, another thing that is somewhat inept... is the cast of this show too. There is the housekeeper, Dotty (Carol Burnett), an aged starlet, who in real life is in a liaison with the frustrated estate agent, Garry (John Ritter). Then there is the owner’s of this fictional house, Freddy (Christopher Reeves), a simpleton with an aversion to violence, with his fictional wife, Belinda (Marilu Henner), a gossip queen with an itch to scratch. Plus on top of that, there is the fictional burglar, Selson (Denholm Elliott), a half-deaf drunkard, and the estate agents fictional beau, Brooke (Nicollette Sheridan), who is in a very real relationship with, Lloyd the director of this show. Oh! And I best not forget to mention the backstage players, huh? As there is the clumsy stage-hand, Tim (Mark Linn-Baker), and the be-smitten stage manager, Poppy (Julie Hagerty), also. OK, so with all this in place, how can anything go wrong? Well, it does. But they all somehow make it through the final dress-rehearsals, and they manage the first couple of outings in the field, after a fashion. However, by the time they all reach Miami Beach... errr... the times they are a changing? Garry suspects Dotty is cheating on him with Freddy. Lloyd tries to patch things up with Brook, even though he has had a fling with Poppy. And Sheldon is forever chasing the bottle. Granted, the play does play out, but not without numerous instances that interrupt this performance, such as the backstage fighting – the pranks that the cast plays on each other on stage – and the revelation that Poppy is pregnant with Lloyd's child. Ha! And if you thought things couldn't get any worse than that, when they eventually move on to Cleveland, things do! Cues are missed – lines are mumbles – and overall the whole production is one half improvisation, and one half battlefield. Can things get any worse you might wonder? Well? Finally, there is New York – and a stage on Broadway – where miracles do happen you know. 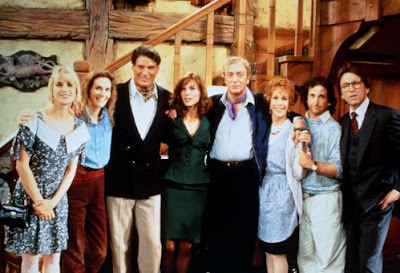 'Noises Off' is one of those films that is just great to watch on a Sunday evening. It is full of farce, slapstick, character, and plot, evolving scene by scene by scene upon a theater style backdrop. Now I have to admit, I have seen the Broadway show of the same name before, so I was not really expecting that much from its filmic counterpart at all. But as the old saying goes, if you don’t expect much, the most you can expect is a surprise, right? And boy-oh-boy, was I surprised. From start to finish, this movie just made me want to crack-up. Not only was it fairly faithful to its theatrical counterpart, but it also enhanced certain aspects which I didn't think could be enhanced upon. The comedy is just relentless, and throws gags left, right, and center, both in a verbal and a jovial manner. For me, personally, Michael Caine is the glue that holds this film together. But even though I say this, the rest of the cast really do only come a slight second best by a whisker. Reeves – Elliot – Burnett – Ritter – Sheridan – Henner – Hagerty – and the rest, are just a brilliant piece of casting, as I have not seen any of them perform in this manner in a film previously. I wonder if any of them actually performed this play on stage, huh? As that would explain why they are so good in this film. Also, for you pervs out there, you might like to know that Nicollette Sheridan is half naked throughout most of this film, and would be pleased to know what a nice a$$ she had when she was younger (still does for that matter). Another nice a$$ is me for mentioning this fact. Well, I felt that her booty is worth mentioning for its news-worthiness alone. Viva la a$$ - viva la revolution – and viva la 'Noises Off'.